Houston has another historic stadium in it that’s seen better days, but this one is still in use and has some hope of being restored to its former glory. As a place to watch a game, there are few better than Rice Stadium, thrown up almost overnight between the 1949 and 1950 seasons. But it also was a time before television discovered college football. And before professional sports discovered Houston. Times changed. Today, as the Rice Owls play for their first outright conference championship since 1957, it is an apt moment to ask whether the city’s first great stadium, with seating for 70,000, has outlived its usefulness. Rice boosters say yes, reluctantly. And no, emphatically. “Was” is the operative term in McGinty’s assessment. Less than a generation after it was built, another Houston stadium became the most famous sporting venue of any sort. But he remains ever-loyal, in no small measure because his father was on the team of designers. All true. Yet with the passing years it became a little too big, and a little old, and more than a little lacking in modern amenities. Now a plan is afoot to do something about that. The school has contracted with HKS Architects, a leading national firm with the Dallas Cowboys’ new stadium among its many credits, to do a study of stadium enhancement and athletic department needs. Their conclusions will result in a plan that will supplant the one approved by trustees two years ago that went nowhere. That in turn will spark a major fundraising effort to put the school’s athletic facilities on a par with those of comparable schools, including Stanford and Duke. 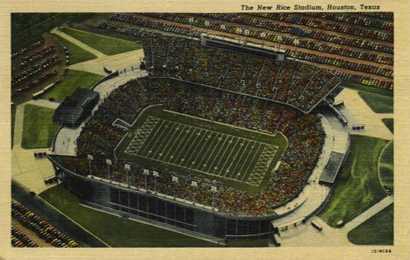 Offcite had a nice story about Rice Stadium and its historic value the other week. It’s worth clicking on just for the pictures. As someone who has been at Rice Stadium for nearly every home game since 1988, I can tell you it’s a great place to see the game. You’re close to the action, the sight lines are outstanding, there’s really not a bad seat in the house. The amenities, if you can call them that, are embarrassingly bad, and are a big impediment to the football program being seen as modern and competitive. Just having concessions and bathrooms that aren’t 1950’s vintage would go a long way. We fans have been clamoring for upgrades for years, maybe now we’ll finally get them. I sure hope so. Wow! Nearly every home game since ’88!? Impressive! Yep – 26 seasons with The MOB and counting. Some of those games were more fun to attend than others, but I’ve greatly enjoyed it.